Those clothes, floating up, up to the clouds, the stylish turn of the ladies' heels, those washers & dryers painted so attentively, & of course, that Dynamic News. 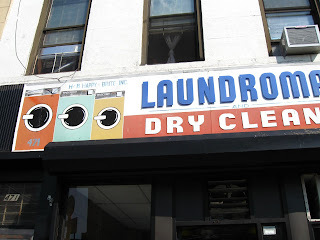 It's a laundromat vision, and I'm thinking tonight I'll dream spin cycles. A fine storefront sign at 8615 Northern Boulevard. Good news about Sunny's, but on the doorstep, not so much. Leaving the house, I was greeted by this, a sure sign that the construction is set to begin. We thought of christening the portable restroom, but it was turned door to the fence, & padlocked shut. So it's hello to foundation work, pilings, construction et al. Just in time for the lazy days of breakfast outside, & late afternoons, sitting in the shade with a drink in hand, surveying the back yard kingdom. Just as the raspberries ripen and the herbs and tomatoes take off. Curses upon developers. And if you're interested in the four-storey-plus-penthouse properties? Prices projected at a million plus for each of the apartments. The newly restored B & B Carousell is up and running on the boardwalk, though when I was there I saw just a couple of adults trying it out. The Illions horse (seen above), a standout from the other, original steeds, was made by Illions, a Coney Island carver, in 1909, one of four horses created in celebration of Lincoln's centennial. According to a Times article Todd Goings, who restored the carousel, wanted the Illions horse to be kept out of bounds to riders, in order to preserve it, but the city's Economic Development Corporation disagreed. So how long will the note stay up? The carousel itself looks just grand - I love those flowing horse tails! - though its dreary glassed-in housing (protective but ill-conceived aesthetically) masks its period charms. The new "Steeplechase Plaza", the $29 million, two acre space the Parachute Jump & Carousell now sit in, is a cheerless affair too, with its any-mall hexagonal pavers and its limp water jets. A dispiriting setting for Coney treasures. Overcast at the beach, but the light still glorious. Ignore the ugliness of new businesses, or old ones with new, generic signs. Don't even try to make sense of the RV-on-stilts comfort stations. Ignore the TV screens in Ruby's, and watch the bronzed sixty-something lady next to you, sitting alone in the crowded bar, content with a beer and a paperback. Or the grandfather in front of you, dancing to the jukebox oldies, baby in arms. Or the kid with a parrot on her head. Watch the tide of boardwalkers, crammed into too-tight swimsuits, or modestly clad in unbearably hot looking long-sleeved shirts and calf-length skirts. The swaggering, and ambling, the screams and the laughter. Some in groups and some alone, and everyone exactly as they should be, everyone at ease in their own dressed or undressed skin. The city at its best, and every single person there a thing of beauty. "Small metal awnings and their translucent cousins were once a staple over stoops across New York City, on houses made of brick or clad in vinyl, and even on brownstones. They can still be found in one neighborhood after another, sometimes on every home of a block. They provide shelter as you fumble for your keys in the rain, and they keep snow from collecting at the top of the steps. Yet they appear to have fallen out of fashion. In areas like Greenpoint and Windsor Terrace, where new owners with extra cash to spend on aesthetics are buying old houses, some of which last saw a sprucing up during the Johnson administration, the awnings can be a casualty of gentrification." No casualties here on the East Elmhurst/Jackson Heights border. The S & P news stand was given a glassier look back in December, much to my distress, but it has remained signless since then. Would the old name ever reappear, many I wondered? No, it would not, I can now report, because a yellow plastic banner now proclaims it to be Park Beer Store. Oh, it seems to have reached a new low. Now that's a beautiful array of fire escapes, striped shadows and all. 17th Street. At 168th, right by the subway entrance, the Hillside Inn. There used to be an "Irish" atop the sign, but that's gone now, though the older guys outside the bar seemed to suggest that it's still hanging on to its roots. 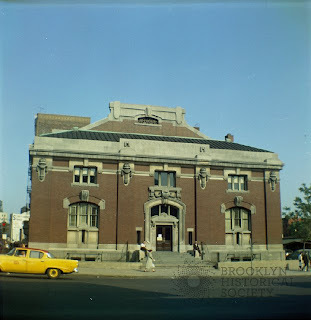 Still, the library is safe for the moment, and residents and community groups did a stellar job in protecting it during these critical last months of the Bloomberg administration. Get down to Pacific & celebrate. 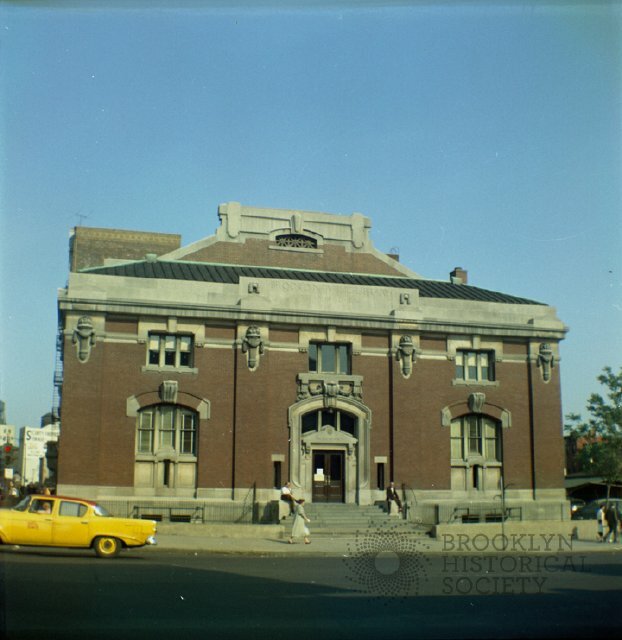 There's no good news - short term or otherwise - for the Brooklyn Heights branch though, and it's up to all New Yorkers who value their public library systems to continue to fight for their preservation. "A small green space at the edge of the Brooklyn—Queens Expressway would be rebuilt as “Brooklyn Landing” — with a soaring hot air balloon to take visitors 600 feet in the air, plus a terrace with picnic and ping-pong tables." Then I thought of my last place, of Monsieur Jean, the valet, so distinguished with his black side-whiskers and his white skin, for which he cared as if he were a woman. Ah! he was such a handsome fellow, Monsieur Jean, so gay, so nice, so delicate, so artful, when at night he read aloud to us from the "Fin de Siecle" or told us salacious and touching stories, or familiarized us with the contents of Monsieur's letters. Things have changed today. How did I ever come to get stranded here, among such people and far from everything that I like?" The Middle Eastern presence on Atlantic may have declined somewhat over the years, but it's still one of the true pleasures of the avenue. Sahadi's is booming - expanding even - despite the Trader Joes across the street, and Damascus still offers the best savoury pastries, breads and mezze around. Hang around in Malko Karkanni Bros Inc., chat to the owner, watch the store cat mooch around her kingdom, buy some honey, candy, oils and syrups, a spouted cooking pot, pistachios. A pocket of the city to relish. You can still rely on laundromats and liquor stores for some old-school looks, but alas, the vinyl awning makeover is insidious. Take Fifth between 10th & 11th. A couple of months ago Sun Bo Bo was vinylized, as it turned into Far East, and now its next door neighbor, H & B, has gone for an update. A little less happy & brite. A bad case of subway inertia, and time for a break from the old routine. Vacation just around the corner! A new, beautiful Walkers in the City essay. Some repairs at the 314 12th condo building. I think this is the in-contract penthouse. Some units still available!! Walking around this part of Kew Gardens/Forest Hills made me feel positively juvenile, but the aging populace seemed braver than I was as they made their way -slowly but surely - across the Boulevard of Death. I bolted over it in terror. There were some splendid hats and boldly applied cosmetics to be seen about the boulevard, and a general careful attention to style. The retail strip between 78th and 77th Avenues is a fine demonstration of demographic needs, and exhibits its own older New York charms. Pharmacy & surgical supplies, Hot Bialys/Bagels/Appetizing, Ginza wigs, Boulevard Hearing Aids, and my favorite: H.Goodman Furs, in business since 1908. A charming lady from the store came outside when she saw me taking pictures, and told me that Goodman's, family owned for three generations, relocated from the Bronx in '68. She said that business was still good. I admired the store sign, and she said that the FURS part still lit up at night. That would be a treat to see. Mezini open this weekend - chandeliers, $3 Smirnoff special offers, and some textured wall details redolent of theme parks. Pastas & fish/meat dishes from $14 to $33 dollars. Seafood platters $60 or $100. The VFW Post is still stuck under subway renovation scaffolding & boarded up walls. Here's a rendering of the fixed-up station posted on Gowanus Lounge in 2007. In early 2011, completion was projected for the end of the year, with retail spaces operating in 2012. More recently, CB6 reported that renovations would be complete by the end of last month. This seemed a trifle optimistic.